Note: this monomer has been used in our own lab for the synthesis of PCE10 and PTB-7. Chemical structure of 2-Ethylhexyl 4,6-Dibromo-3-fluorothieno[3,4-b]thiophene-2-carboxylate. CAS No. : 1237479-38-7. Chemical formula: C15H17Br2FO2S2. 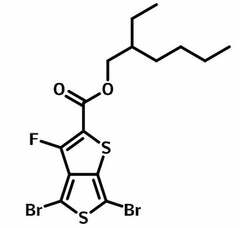 2-Ethylhexyl 4,6-Dibromo-3-fluorothieno[3,4-b]thiophene-2-carboxylate has been used for the synthesis low band gap polymer semiconductors such as PTB-7 and PCE10 (also called PTB7-Th or PBDTTT-EFT) for OFETs, OLED, PLED and OPV applications. Study of Optical Properties and Molecular Aggregation of Conjugated Low Band Gap Copolymers: PTB7 and PTB7-Th, F. Bencheikh et al., J. Phys. Chem. C 2015, 119, 24643−24648 (2015); DOI: 10.1021/acs.jpcc.5b07803. Random terpolymer with a cost-effective monomer and comparable efficiency to PTB7-Th for bulk-heterojunction polymer solar cells, T. Jiang et al., Polym. Chem., 7, 926-932 (2016); DOI: 10.1039/C5PY01771H. Tuning nanoscale morphology using mixed solvents and solvent vapor treatment for high performance polymer solar cells, D. Wang et al., RSC Adv., 4, 48724–48733 (2014); DOI: 10.1039/c4ra09417d.